Samsung is now mass producing the industry’s first 128-gigabyte (GB) ultra-fast embedded memory based on the much-anticipated Universal Flash Storage (UFS) 2.0 standard for next-generation flagship smartphones. The new embedded memory’s UFS 2.0 interface is the most advanced JEDEC-compliant, next-generation flash memory storage specification in the world. UFS memory utilizes “Command Queue,” a technology that accelerates the speed of command execution in SSDs through a serial interface, significantly increasing data processing speeds compared to the 8-bit parallel-interface-based eMMC standard. As a result, Samsung UFS memory conducts 19,000 input/output operations per second (IOPS) for random reading, which is 2.7 times faster than the most common embedded memory for high-end smartphones today, the eMMC 5.0. It also delivers a sequential read and write performance boost up to SSD levels, in addition to a 50 percent decrease in energy consumption. In addition, the random read speed is12 times faster than that of a typical high-speed memory card (which runs at 1,500 IOPS), and is expected to greatly improve system performance. In the future, Samsung anticipates that UFS will support high-end mobile market needs, while eMMC solutions remain viable for the mid-market, value segments. For random writing of data to storage, the blazingly fast UFS embedded memory operates at 14,000 IOPS and is 28 times as fast as a conventional external memory card, making it capable of supporting seamless Ultra HD video playback and smooth multitasking functions at the same time, enabling a much improved mobile experience. 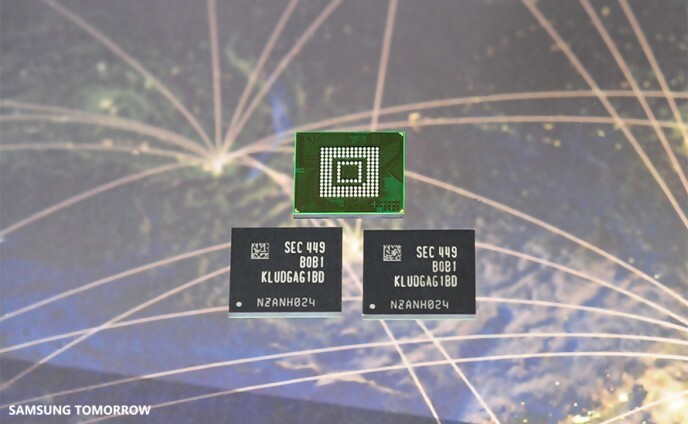 Samsung’s new UFS embedded memory comes in 128GB, 64GB and 32GB versions, which are twice the capacity of its eMMC line-up, making it today’s optimal memory storage solution for high-end mobile devices. In an attempt to provide more design flexibility to global customers, Samsung’s UFS embedded memory package, a new ePoP (embedded package on package) solution, can be stacked directly on top of a logic chip, taking approximately 50 percent less space. Over the next several years, Samsung will continue to set the pace for memory solutions that combine truly high-performance with high capacity.